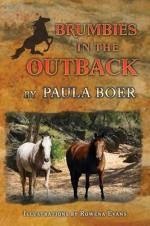 Brumbies in the Outback is the fourth book in Paula Boer's stunning Brumbies series, and like its predecessors, combines an enthralling storyline with real life experiences of brumbies and other equines in their Australian setting. The two main characters in the novels, Ben and Louise, are now two years older, and the author has matched her writing to their more mature ages of sixteen and fourteen years. The two friends have enjoyed many brumby related-adventures and former townie, Louise, has worked hard to increase her level of horsemanship. However, when she is persuaded by Ben to come with him to his Uncle Graeme's million acre cattle station out west for the school holidays, Louise is challenged in ways she did not expect. In the past Ben happily shared his farm and horse knowledge with Louise, but suddenly Louise finds herself sidelined by the close relationship Ben has with his feisty, patronising cousin, Jacinta. Ben seems oblivious to his cousin's hostility towards Louise which is relentless, and at times he, too, adds to the discomfort Louise is experiencing. Nevertheless, she does her best on a borrowed horse to herd cattle into the yards and on to the transport trucks, and gamely tackles other tasks involved in the operation of a cattle station. Louise is constantly confronted with new situations which test her riding skills and showcase her ignorance. One such instance, when she is charged by a bull, is life threatening. Ben is less than understanding, and all reader sympathy goes to Louise who often wishes she had said no to Ben's invitation. She is stuck in a difficult situation but is determined to meet every challenge headlong. It is Uncle Graeme who proves to be the most support. The level of tension Boer brings to her story is commendable. Not only is the reader drawn into the scenarios with all the attention to detail which has become the author's trademark, but one's sense of justice is well and truly sparked. At the same time, young readers are given an underlying lesson in patience, perseverance, forgiveness and courage in the persona of Louise. Rowena Evans has enhanced the pleasure of the unfolding story with her apt black and white illustrations and maps. The author herself is responsible for the charming cover photo, and once again the Glossary at the commencement of the book offers further opportunity for readers to learn more about horses, cattle and other relevant subjects. There is no doubt that this series will continue to delight lovers of horses and the bush.